So, the new RCUK open access policy is now in play… and guess what – there’s plenty of journals out there that are not accommodating it at the moment. Perhaps this is just out of ignorance? Perhaps this is an area where a little nudge from interested parties e.g. open access advocates, RCUK-funded academics, and other concerned people might help? With this aim I have just emailed the editorial board of the Taylor & Francis journal Systematics and Biodiversity to let them know that their journal is not currently RCUK-compliant (see screenshot from FACT below). As you may know, Research Councils UK (RCUK) have instituted a new open access policy to further the dissemination and re-use of all RCUK-funded research. Included within RCUK is BBSRC, MRC, NERC & STFC. This policy came into force on 1st April 2013. All papers to be published in future, arising from RCUK-funded research must now comply with this new RCUK policy or they will not be REF-able. Publishing in a non-compliant journal may also adversely affect future grant applications. The University of Nottingham has made a helpful website to let people check before they submit their manuscripts – which journals are RCUK policy compliant, and which journals are NOT compliant. 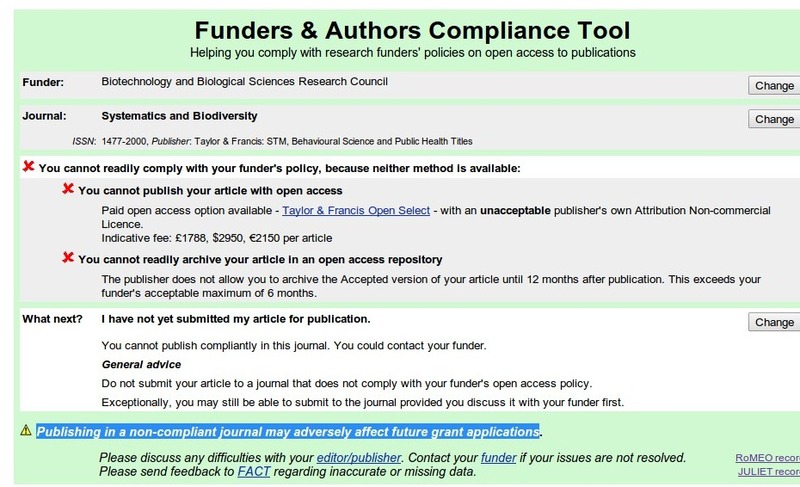 I was browsing this website and discovered that your journal: ‘Systematics and Biodiversity‘ (ISSN: 1477-2000) is NOT compliant with the new RCUK policy, for researchers with BBSRC, MRC, NERC or STFC funding. May I suggest you discuss this at your next editorial board meeting? It may also interest you to note that an entire editorial board recently resigned from a Taylor & Francis journal over a similar dispute relating to open access & licencing. I’m sure you need not necessarily take such drastic action. I’ll let you know as and when I get a response to this email. It’s very kind of you to do the journal’s homework for them like this. I am inclined to leave journals that can’t be bothered to understand these issues to die a natural death. There are plenty of other journals that actually care about communication. More seriously indirectly, it might well help dissemination & awareness of the new RCUK policy, and the fact that many journals do not have compliant routes, (and of those that do, they are sometimes only really expensive ‘hybrid’ OA options). Well, they might die a slow death, but they’ll take a lot of research and time with them. Best to have the information out their and compliance dealt with – it’s all about communication communication communication! :) Ross set an awesome example here. Mike – I have this problem with many “mainstream” #scholpub including learned socs. Some of them are not going to die soon. Hello Ross, I’m the Open Access Publisher at T&F and wanted to drop you a quick note to say that this journal *is* in fact compliant with both RCUK’s green and gold OA policies, as are over 1,600 Taylor & Francis / Routledge-published journals. The SHERPA team have received a list of journals with updated licence information and (Accepted Author MS) embargo periods to load to the FACT database – I understand that they have a significant backlog of data to work through which is why information that is currently displayed is out of date. This information will however be available on our website from tomorrow, along with a raft of updated information about our open access offerings (http://journalauthors.tandf.co.uk/preparation/OpenAccess.asp). I’d welcome your thoughts on these updates once they are live. On the T&F website it clearly says “What restrictions on reuse apply? For non-commercial purposes only” this would not be compliant with the RCUK ‘gold’ route of immediate open access. RCUK requires CC BY. CC BY-NC , or other licences that restrict commercial re-use are not compliant. in a PDF file, and in this it says the embargo period for this particular journal is 12 months. I thought BBSRC required a maximum embargo length of 6 months for the greenOA route to be acceptable? This would seem to be indicated by the FACT tool too. Which if any of your OA options for this journal are RCUK compliant? HI Ross, yes our online information is being updated in the next couple of days but esentially we will be offering CC BY as a licence option to any author publishing on an open access basis (pure or hybrid), including to S&B authors. As the journal does offer the gold OA option (with the CC BY licence), it complies with the second route to Green OA with its 12 month embargo period, as outlined in the decision tree included in the revised RCUK guidance(http://www.rcuk.ac.uk/documents/documents/RCUKOpenAccessPolicyandRevisedguidance.pdf). We plan to make information on embargo periods much easier to locate than they are at present, and will have links to licensing and embargo period information from the Instructions for Authors page for each compliant journal. I hope that this provides some reassurance. Great to hear. Please do let me know when you have updated this information on your website. I’m sure FACT will change their listings for T&F when T&F themselves bother to update their information! Can’t T&F have done all this *before* April 1st? Why implement these changes only after the policy is in action? Does it really take 260 days / 37 weeks to change one or two details across a few websites? Ross, based on my experience with some publishers who you really think would know better, the answer to “does it really take this long?” is yes. Shockingly enough, many of them (not sure if T&F is included here) have outsourced the development of their sites and have little to no technical staff on hand, thus something as simple as updating a sentence on a page becomes a complex and expensive task for them. That said, I think once Vicky said they were in the process of updating the site, it might have been sufficient to respond with a thank you, instead of continuing to berate her about being too slow. I think you are doing a great job that as Mike has said the publishers should have done.